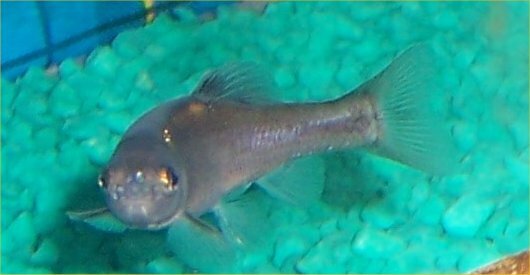 The only known web site about fathead minnows and rosy red minnows as pets in aquariums and ponds, the largest known non-scientific web site on fathead minnows, and the only known web site on rosy red minnows. Let me know if you find another site!! Here are some rosy red minnows belonging to Mike and Carol. Thanks for the great photos! The minnows are about 1.5 years old. The intense lighting used to take the photos appears to "wash-out" the fish somewhat. For more awesome photos of their rosy red minnows spawning, eggs, and fry, go here. This page has been divided into two pages for easier maneuvering. Be sure to read not only this page but page two on these great fish!! Why are they so great? Here are eleven reasons! Leslie had the following to say about this site and rosy reds on 7/22/03: "...I also wanted to say that I would not have looked at rosy reds twice until after I found your site. I have found them to be just as fun to watch and pretty to look at as my other fish in my pond and I think they are overlooked as pet fish. (When I told the clerk at PetsMart I wanted them for my pond, he looked at me like I was crazy and said, 'These are just feeder minnows!') Thanks for having such a good site!!" I hope to one day have the time to redo and divide these minnow pages and expand on them! 1. They will not harm any fish of which I know (except small fry when they are hungry). 2. They can be used to feed carnivorous fish, reptiles, and amphibians. 3. They only grow to about two inches on average. 4. They breed just like cichlids! 5. They are so prolific that almost anyone can soon have thousands and yet their breeding is easy to control in an aquarium if you do not want fry. In a pond, natural predators (frogs, orfes, snakes, turtles) keep them in check while also distracting predators from eating your other species of fish. 6. They can survive from right above freezing to the 90's (degrees Fahrenheit). 7. They make excellent aquarium and/or pond fish! 8. They each have their own personalities. 9. They are beautiful in my opinion. 10. They are inexpensive, typically one US dollar for a dozen. 11. They eat mosquito and other insect larvae and some algae but do not harm higher plants. The only downside to these fish is that, since they are sold as "feeder fish" or "bait," they usually have parasites and other health problems due to overcrowding and poor care. Medications and good care can reverse this. Pick apparently healthy fish with which to begin. To treat a newly bought batch of rosy reds, I used Aquari-Sol by Aquarium Products, Inc. at half dose (I have soft water) for four or five days in a 5 gallon quarantine tank where they remained for two weeks. I vacuumed water off the bare bottom daily and used a corner filter. Salt levels of about 1 Tablespoon per 5 gallons were used initially but diluted with the daily water changes. Extend the quarantine if any fish die. For more details on the "feeder" rosy reds that I bought and treated in 2003, see my March 2003 pond newsletter under Happenings at Robyn's Pond. 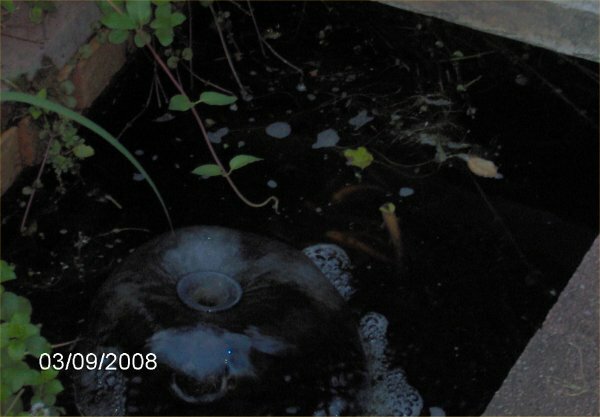 If you ever need to trap out excess or unwanted rosy red or fathead minnows, you can use the trap that is described on my mosquito fish page. 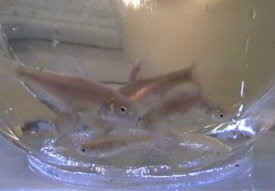 Fathead minnows are used in biotoxicity tests. Ten newborns are placed into containers with the client's water. After a week, any survivors are killed and weighed. The number of survivors and their weight is directly proportional to the toxicity of the water. I worked at a place that did this for two months. After I could no longer take torturing fish, I left and took a few dozen fatheads with me. 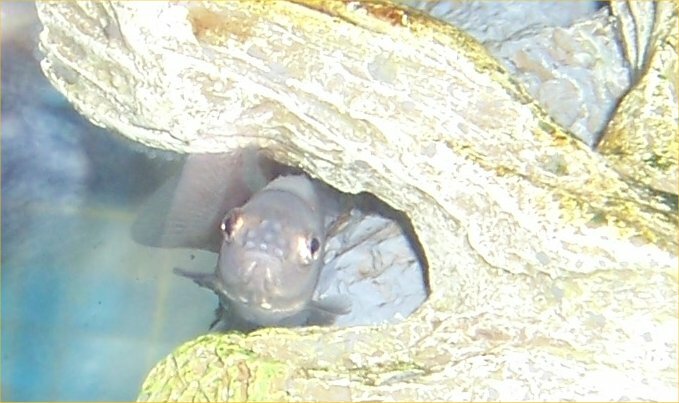 The knowledge I learned and the fish I took home began my life keeping aquariums and ponds. Before then, I had only had a few goldfish. Fathead minnows and sometimes rosy red minnows are sold as bait to hook onto lines to catch larger fish. Many anglers only learn about small fish as bait. I do not fish. Rosy red minnows are quickly competing with goldfish as the "feeder fish." Since they breed so well, rosy reds are sold in large quantities for $1 a dozen to be fed to other animals. Piranha, oscars, other large piscivorus and omnivorous fish, aquatic turtles, water snakes, semi-aquatic lizards, and other animals all may eat these fish. Since rosy reds stay smaller than goldfish, they are better suited to feeding smaller animals. 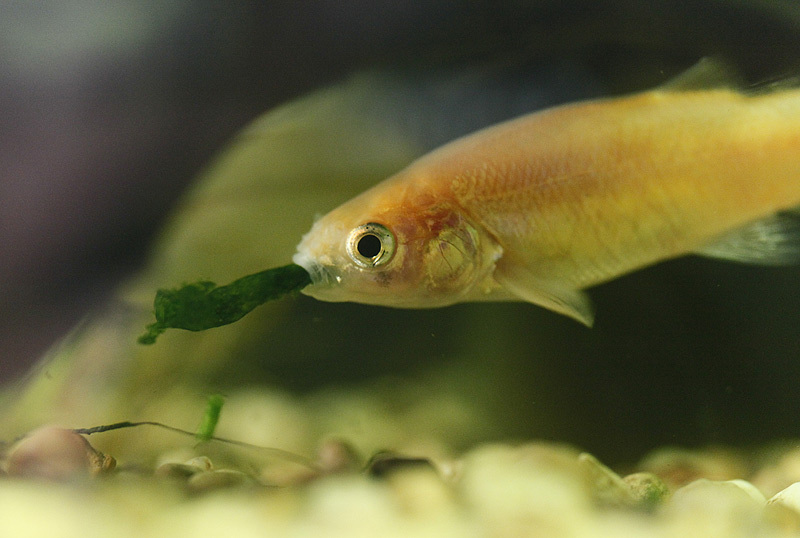 Due to their poor care, "feeder fish" are usually infested with parasites, bacteria, and diseases. Because many aquarium and pet store owners know little or nothing about rosy reds and fatheads, they call these fish all sorts of things, from rosy reds to tuffies (where did they get "tuffy" from anyway?) 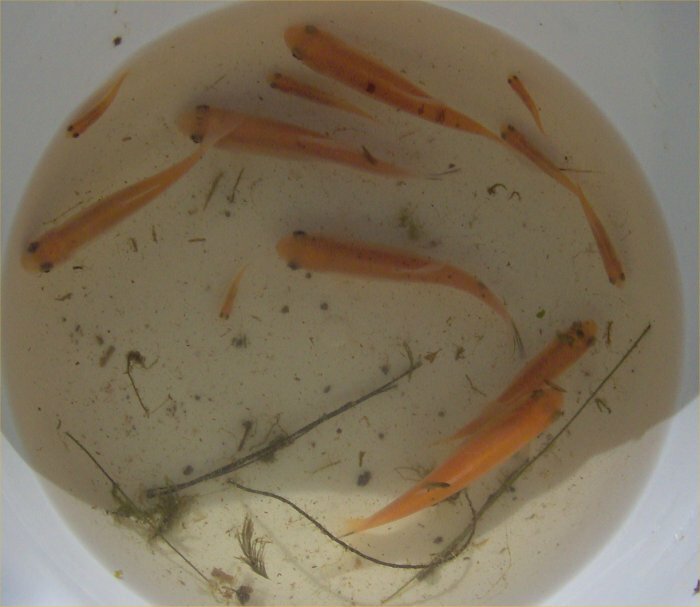 to plain minnows to mutant goldfish to "I have no idea what they are; they're feeder fish," and have no idea about their care at all (the other fish are supposed to eat them right away). I have seen golden orfe (they look similar as babies but grow to over a foot and are totally different fish) sold as minnow "feeders." When I told the workers they were not rosy reds, they said, "Of course they are, that's what the sign says!" And here people in other parts of the store were desperately looking for orfe and paying $10 a piece for them. A few aquarists keep rosy red and/or fathead minnows in aquariums to admire them for themselves. I am one of the few. These are my favorite fish. 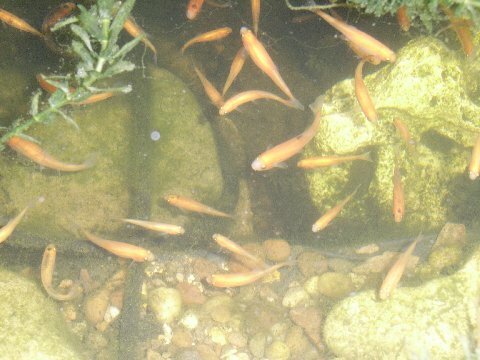 Rosy red minnows and sometimes fathead minnows are being more frequently added to ponds. They are added as dither fish to make larger fish (koi and goldfish) less cautious and more active. They are added to provide a constant food supply for larger fish (orfe, game fish), turtles, and predators (the raccoon will take a tasty rosy red any day). They are added to make the pond seem more alive. They are added to provide movement during the winter when larger fish are resting (rosy reds like to cruise under the ice). They are added when the pond is simply too small (tub gardens, etc.) for larger goldfish or koi. And finally, in my case, they are added because I love them! Rosy red minnows and fathead minnows are often sold at bait shops as bait. 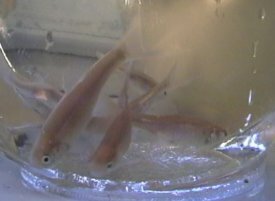 Rosy red minnows are often sold in aquarium and pet shops as "feeder" fish. Sometimes there will be some fathead minnows mixed in. Zett's Tri-State Fish Farm & Hatchery in West Virginia sells mostly game fish in the area. Call 814-345-5357 for a free catalog. Unfortunately, I cannot buy from them because they only sell in huge quantities, usually 100+ fish. They sell both rosy red minnows and fathead minnows. If you or someone you know works at a school, university, or at a science-related business, Carolina Math and Scientific will send you a catalog there. They will ship to individuals homes, just not send the catalog there. Their number is 1-800-334-5551. They sell fathead minnows (no rosy red minnows). Hunting Creek Fisheries in Thurmont, Maryland sells rosy red minnows. Willow Pond Aqua Farms sells fathead minnows. You can go to their web site or call 1-888-854-8945 for a free catalog. These are all the sites I could locate on fathead minnows using search engines. I was not able to find a single web page with reference to the rosy red minnow (ok, I finally found the last few sites listed). All of these pages refer to the fathead minnow as either a wild native fish, bait, or research subject. None of these pages mention keeping the fish as a pet in an aquarium or pond except to say that some people do. All of these sites are small. If you know of any sites on rosy red or fathead minnows, please let me know. Fatheads - information on breeding and general information. As of 9/99, this site has vanished. Please e-mail me if you know what happened to it. Fatheads - drawing of adult non-breeding male. Fatheads - drawing of adult breeding male and adult non-breeding female, the colors (especially the female) do not look at all like the real colors on fatheads but the body shapes are fine with the exception that the male should be much larger than the female. As of 9/99, this site has vanished. Please e-mail me if you know what happened to it. Minnows - includes a small section on fathead minnows. Billy Bland Fishery, Inc. History - includes information on the development of the rosy red minnow. The Life and Times of Fathead Minnows - information on fathead and rosy red minnows and breeding. On 1/1/05, someone sent me the correct URL since this article had moved so this one should work, for now. Eric's Fishcam - a live video feed from an aquarium containing young rosy red and fathead minnows! Fathead minnows - a short article. 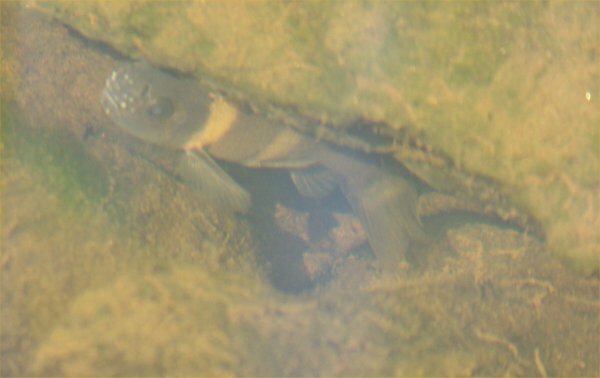 See the native fish page for links to native fish web sites that include information on fathead minnows and other native fish. A visit to this site will leave you thoroughly perplexed as to the actual identity of the rosy red minnow. It also has a recounting of some breeding of rosy reds. Judy's rosy red page has stories and photos of her rosy reds and a video of her rosy reds spawning. 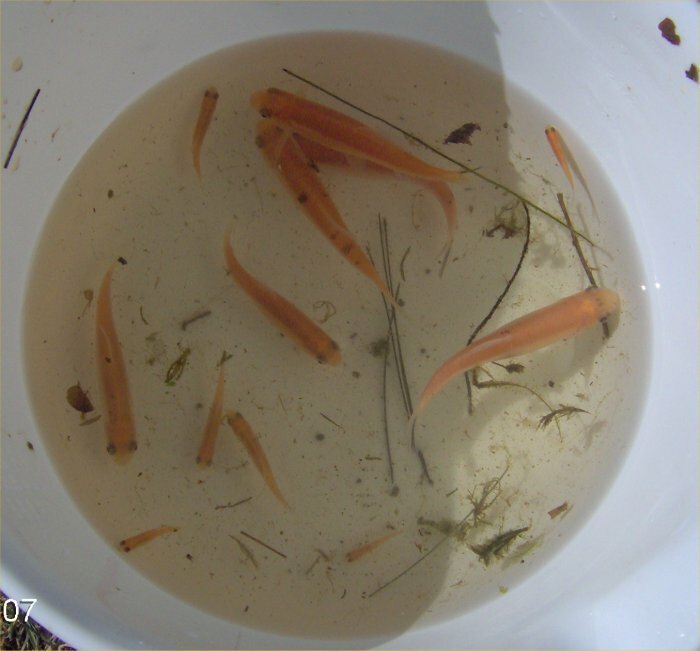 Caring for Fathead Minnows - geared towards keeping "feeder" minnows. Includes a bunch of photos. Breeding the Fathead Minnow (rosy red) - a short article on an oscar site. I found it because the last photo comes from my site (I use a service that sends links that were made to my site). The photo was sent to me so I do not even own the copyright and yet this person did not ask for permission to use copyrighted material. At least they included my basic URL. There are a few other "stolen" photos there of breeding fatheads. Rosy Red Minnows - an story on rosy red minnows and breeding. 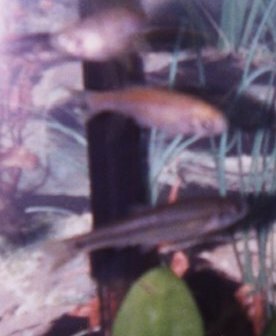 From top to bottom are a female longfin albino zebra danio, a female rosy red minnow, and a female fathead minnow, taken 9/27/98 in my 20 gallon tank. 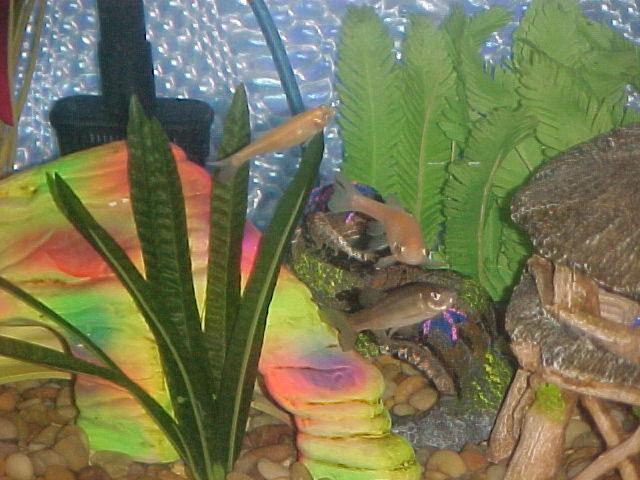 All three fish were about 2 inches long and over 2 years old at the time except the fathead who was about 1.5 years old. This female fathead's father was a rosy red, the brother of this female rosy red minnow. I cannot get my new camera to take descent photographs of my minnows to scan in. If you know of a link with pictures, please e-mail me. In the mean time, I have taken many pictures with my old camera which is able to focus more than 3 feet close unlike my new camera. The photos that follow are NOT good quality but they are all I can offer. Some are digital now (the newer ones) and much better! This is the rosy reds in a bowl on 3/29/07. I was moving them for the pond cleaning (see my pond cleaning page). It looks like I had six babies and six adults in that batch. 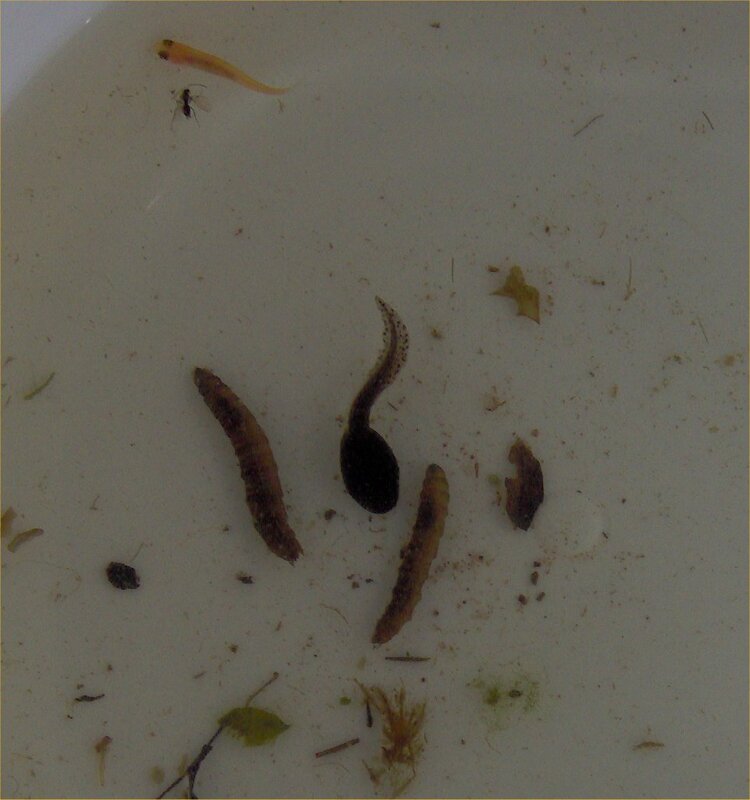 This shows two crane fly larvae (the worm-like animals), a medium-sized green frog tadpole, and a baby rosy red minnow (at the bottom near the end of the video). This video is from 3/29/07 as well. From the 153 pond cleaning on 3/29/07. 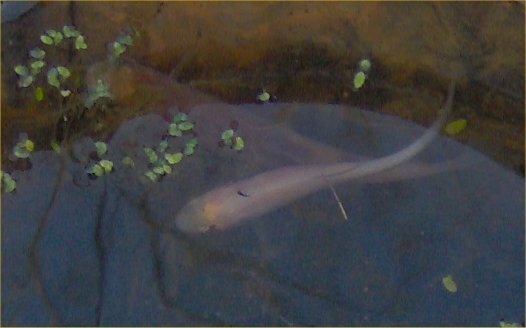 Here are two photos taken of three of my 12 rosy red minnows in my 153 gallon pond when it was cleaned on 3/29/04. Female fathead - in my 20 gallon tank on 9/4/00. 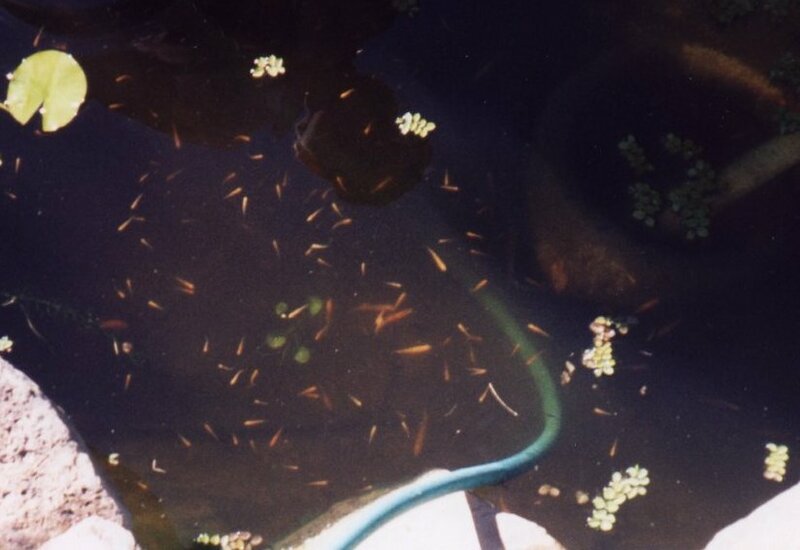 Minnow party - a few hundred rosy red minnows and fathead minnows (fatheads cannot be seen in dark water) congregate by the pump inlet in my 1800 gallon pond in late October, 1998. My mother's reflection can be seen as she took the photo. Female rosy red and female fathead - from top to bottom are a female longfin albino zebra danio, a female rosy red minnow, and a female fathead minnow, taken 9/27/98 in my 20 gallon tank. All three fish were about 2 inches long and over 2 years old at the time except the fathead who was about 1.5 years old. 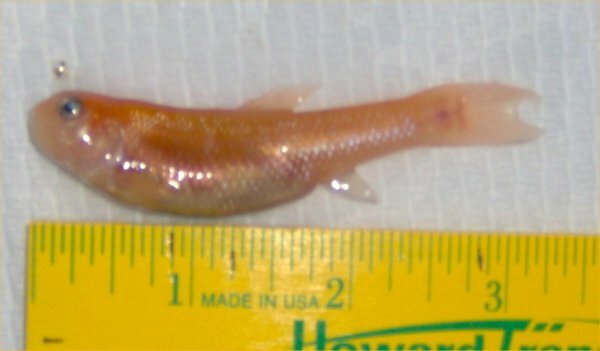 This female fathead's father was a rosy red, the brother of this female rosy red minnow. Female fathead and female rosy red - from top to bottom on the left are a male longfin leopard danio, a female longfin albino zebra danio, a female fathead minnow, and a female rosy red minnow. On the right are two white cloud mountain minnows. 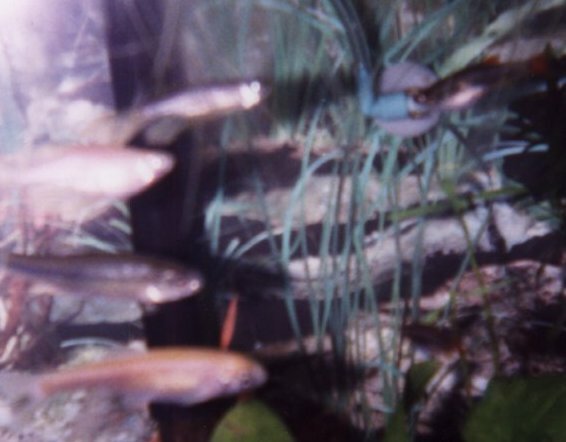 This picture was taken 9/27/98 in my 20 gallon tank. On 2/20/11, Judy sent this cute photo of a female rosy red named Peach eating a plant. 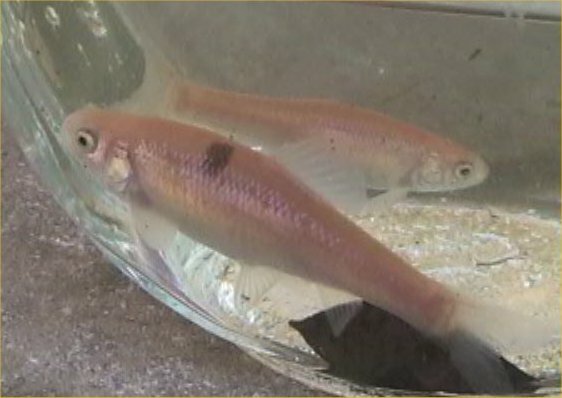 Anson sent this photo on 5/31/10 of a male fathead minnow and a female rosy red minnow spawning in a cave. You can see the eggs above them. On 2/1/09, Gina sent this photo of her rosy red and fathead minnows. On 7/25/08, Mary sent me these photos for identification. It is a male fathead minnow is full breeding attire. He has tubercles on his nose and full vertical striping. He probably has eggs under that rock ledge. 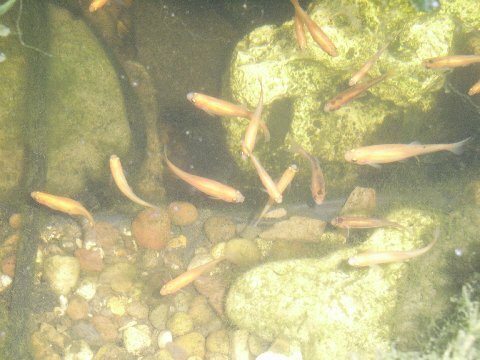 Di, in the UK, sent these photos on 6/8/07 of her rosy red minnows in her pond. Some of them have some darker spots which indicates a reversion back to the natural coloration of the fathead minnows. 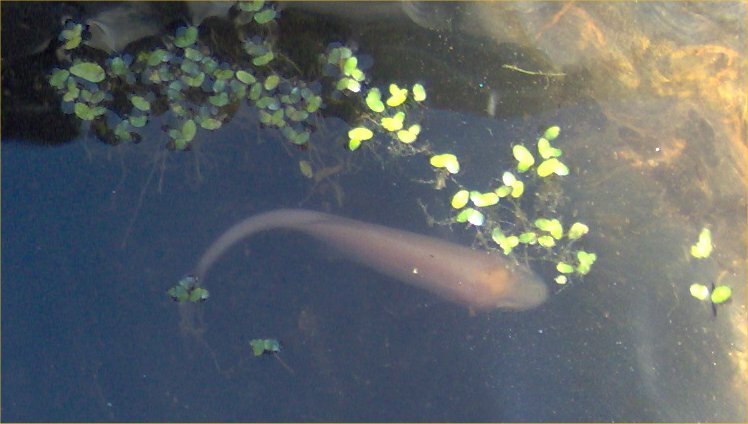 Lizzie sent this photo of a 4 inch fish on 5/26/07 for identification that she found in her pond. 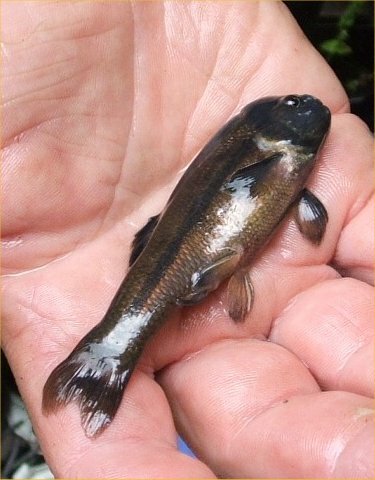 It is an adult male fathead minnow in breeding condition. A person without an attached name sent these two photos of a male fathead minnow on 3/29/06 and 3/30/06. The minnow may have some rosy red blood. 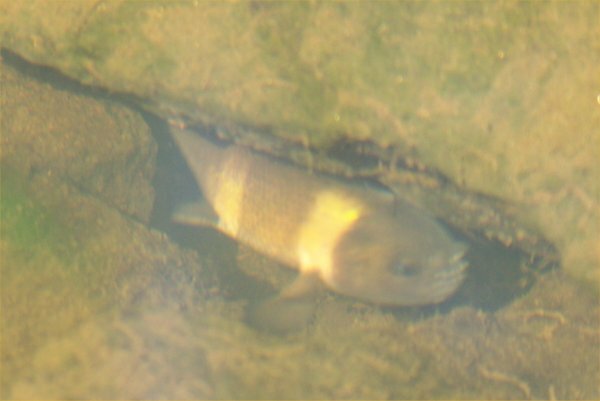 Male fathead minnow - he has eggs above his head to the left in the photo which he is guarding. Here are two nice photos that Mike and Carol sent to me of rosy red minnows: rosy reds, rosy reds. You MUST see Mike's rosy red minnows during spawning. 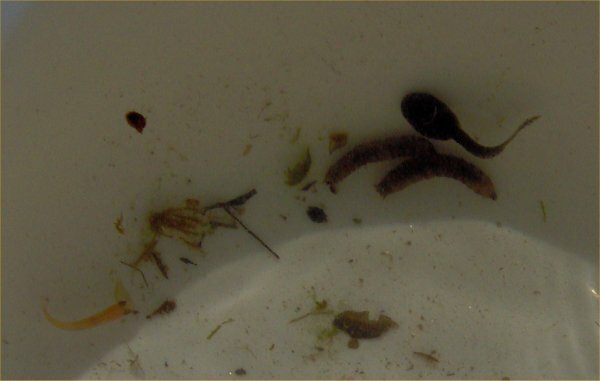 You can see both male and female, their eggs, and fry by going to Photos of Rosy Red Minnows Spawning, Their Eggs, and Fry. 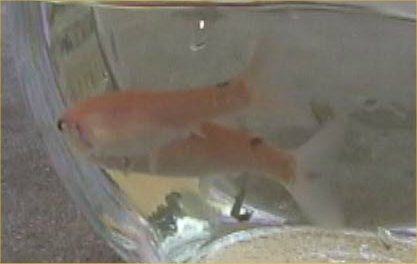 Below is the photo (1/7/01) of one aquarist's young albino fathead minnows. Greg obtained an albino pair who produced these young. These are true albinos! Fatheads. As of 9/99, this site no longer exists. Please e-mail me if you know what happened to it. 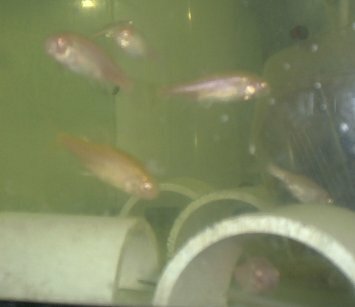 There is a link under the links section above for a live video camera trained on a tank with fathead and rosy red juvenile minnows. See Judy's rosy red page for photos of her rosy reds and a video of rosy reds spawning. Visit the second fathead and rosy red minnow page.